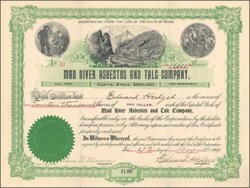 Beautifully engraved certificate from the Mad River Asbestos and Talc Company issued in 1904. This historic document has an ornate border around it with a vignette of men working on a mine. This item is hand signed by the Company’s President (Edward Hedges) and Treasurer (George D. Mears) and is over 98 years old. The certificate had been folded in thirds, but otherwise in good condition.